Awesome! 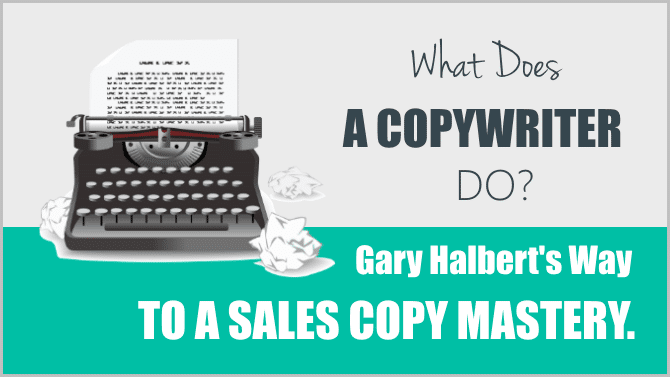 Gary Halbert's Way To A Sales Copy Mastery. For Dummies. “If you’d like to crave success as an entrepreneur then I believe this will be one of the most important topics you’ll ever read. Here’s why. “If the person writing your marketing messages doesn’t know how to craft compelling, meaningful, emotional, and actionable copy, the performance of your entire campaign is at risk of failing,” states Susan Gunelius, a contributor at Forbes. She makes it crystal clear, doesn’t she? That’s why it’s crucial to get your sales pages right! But wait. How in the world do you achieve it? Well, let’s roll up our sleeves and dig into details. Firstly, I am going to give a detailed answer to the question: What does a copywriter do? And secondly, I show you the exact way to a sales copy mastery. 1. What Does the Copywriter Do? The first thing I want to clarify here is the term “copywriter”. A copywriter is a person who is specialised to write ads and promotional articles. In other words, he is kind of a wordsmith who has sharpened his writing skills in this particular area and can turn some content into an engaging, compelling and converting advertisement. What that means, of course, is that his main job is to persuade the readers to purchase certain products or services. It’s called copywriter’s selling power, and it’s the single most important characteristic of a good copywriter. Are your copies able to sell or not? And, you want to increase your selling power, don’t you? Before I tell you what the copywriter does, let me quickly cover things that he does not do. 1.1. Three Things That The Copywriter Does Not Do? 1. The copywriter does not deal with copyright issues. So don’t be confused with the word “copyright“, which refers a creator’s exclusive legal right to his work. 2. The copywriter does not copy a content from one place to another. 3. The good copywriter won’t use unethical techniques to increase sales. For example, he won’t write great sales pages for crap products that stink. Or, he won’t write false testimonials for businesses to raise their level of authority and respect. 1.2. What Does The Copywriter Do? OK, now that you’ve learned who the copywriter is and what he does not do, let’s see what are the things that the copywriter does. Firstly, the copywriter’s task is to take his client’s source material and rewrite it the way that it serves his client’s needs. Usually, it is to sell some products or services. As you see, at the back of every good ad is a lot of hard work. A LOT. The source material can be in many different forms. It can be in the form of some brochure, some technical paper, just a few bullet points, etc. That means the copywriter has to be able to clarify hard-to-understand technical papers and distill benefits into compelling, converting points. Or, he has to be able to write a 500-word article based on these bullet points. The end product of the promotional material can also be in many different forms. The client may want to create an ad or a promotional article, a sales page, a sales letter, some website content or something entirely different. If the client knows just exactly what he wants, he tells it to a copywriter. If he does not know or is hesitant, it is the copywriter’s task to recommend the best advertising options. In the case of Internet Marketing, there are yet other skills that the copywriter has to have. He needs to have a clear understanding of SEO (Search Engine Optimization). The purpose is to attract the attention of search engine crawlers and drive traffic to his client’s sales pages. It, of course, requires that the copywriter understands how to utilize the power of keywords. Also, he needs to be a skilled enough writer to blend those keywords with natural language. After all, it is his task to make the end result as a flowing and coherent piece of text, which will keep its audience engaged. Finally, last but not least, the copywriter is the person who usually builds brands and creates memorable taglines and slogans. 1.3. The Basic Characteristics Of A Good Copy. It is a single, grammatically correct and compelling piece of text. It has the required word count. It includes most interesting sections of information from the source material. It includes some overt or covert marketing message to persuade the reader purchase the client’s product or service. 2. Two Choices To Get A Good Sales Copy. By now you already understand the crucial role of copywriting in your marketing campaign, don’t you? So the next logical question is – How to achieve it? 1. Find a professional copywriter and ask him to write your sales pages (expect to pay for his services). 2. Create the sales pages yourself. For this, you have to learn the fundamental skills of copywriting. So this is what you have. Take it or leave it. Well, anyway, now that you know what your choices are, let’s see, what suits you best. You are going to face two major challenges! Firstly, it’s a jungle! A big scary jungle of freelance copywriters. It’s easy to get lost in it and end up mismatched or getting roughed up financially. Whooee! You sure could get lost in there, couldn’t you? And secondly, hiring a copywriter is expensive. Do you know how much you have to shell out to hire one? Well, John Carlton, one of the top copywriters walking the earth, can tell you. In his article „How to Hire a Copywriter?“ John makes it crystal clear of what to expect. His article is comprehensive but, I highly recommend to read it (and, in fact, bookmark his site). Level two: The veteran direct response freelancer. They have references, success stories, and also „have massive marketing experience“. They are good but not cheap. Top writers ask from $10,000 to $30,000+ „just for fundamental advertising (like a Video Sales Letter, or a web sales page“) and so on. Level three: “A List” writers. Option #2. Learn Fundamental Copywriting Skills And Create Sales Copies Yourself. If you don’t have what it takes to hire a professional, the only other choice you have is to write your sales copies yourself. But wait. It’s not such a bad option at all! “You may have zero skills, and be mostly riding your passion for becoming independently rich into the entrepreneurial world. Did you read it? A PRIMARY asset! That’s just exactly why I think this option is the better one for a rookie entrepreneur. At least in the beginning. Did you also notice that you should make the fundamental understanding of writing a good sales copy? Now that’s pretty much over your head, right? But don’t let that scare you. There is a way and, believe me, an excellent way to learn the best copywriting techniques. Let me explain it to you. Do you remember the third level of copywriters, called „The list“ writers? The best in the world? You do? Great. Now listen up! The best of all of those „The list“ copywriters was… Gary Halbert (1938-2007). And now, this very Gary Halbert comes to a rescue mission – He jumps in to guide you step-by-step and give you all the skills you need to write a compelling sales copy. Don’t believe me? I’ll show you in a minute. But before that, let me tell you a little bit about this mysterious Gary Halbert. Just to give you an impression and build your trust. 3. Who is Gary Halbert? Well, if you haven’t heard him before, Gary Halbert was one of the best copywriters of all time. The “Michael Jordan” of the copywriting world. “In the world of copywriting, all roads lead back to Gary Halbert,” – Paris Lampropoulos. Why was he so powerful? A good question. That’s why: simplicity, clarity, thoroughness and selling power. A pure genius. But you know what? Gary Halbert was not only a master copywriter. He was also a master teacher. One of his characteristics was an ability to distill “his highly sophisticated and hard earned knowledge into simple, easy-to-understand principles that everyone could profit from,” states Ken McCarty in his memory of Gary Halbert. Gary was committed helping others. 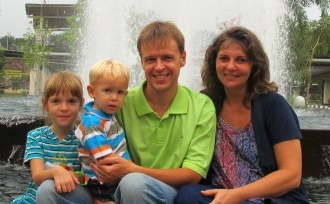 Over the years, he wrote tons of newsletters, which he uploaded to his website to everyone to read for FREE! The Best Copywriting Stuff In The World! Just Read, Absorb, And Learn. Gary Halbert archives include almost all the Gary Halbert letters. Unfortunately, these letters are not organized in ANY way. So you have to say thanks to Ryan McRath, who took the time and energy to sort Gary Halbert letters in chronological order. Now when you know who Gary Halbert was, let’s move on and see how he comes to help you. After all, your goal is to learn to write compelling, selling sales copies, isn’t it? If this is the case then, in my opinion, the best place to start is the Gary Halbert Letter on How To Become a World-Class Copywriter In Just 30-Days. You can achieve these skills in 30 days! And this is just exactly what you want, isn’t it? Well, to achieve the goal Gary gives you quite a few home works and tasks to do. 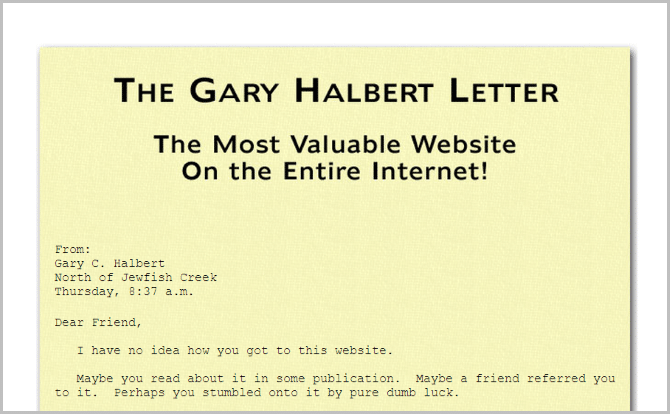 “The Gary Halbert Letter” (all back issues)-by Gary Halbert. I recommend you to begin with The Gary Halbert Boron letters. Firstly, It is something you can do right away. And secondly, Gary wrote these letters from the Boron prison to teach and instruct his son Bond Halbert. Bond was still 15 when he got his first letter and this way, the Gary Halbert Boron letters could easily be called “Copywriting for dummies” or something like that. Also, the letters formed an outline of Halbert’s philosophy of direct marketing. The Nancy L. Halbert Heraldry Letter” (an example sales letter). Again, to save your time here’s Ryan McRath’s post where he provides all the links to the Gary Halbert ads. In fact, Ryan had to spend “countless hours online trying to track each of these down”. It wasn’t an easy task for him, but he made it very comfortable for you. Just go to his page and download the ads. If you want to get the results Gary promises you, better follow his instructions word-by-word. Listen. I have done it, and I have found it amazingly beneficial exercise! Well, anyway, this is how you get you started. There are much more to do. It’s impossible, in this brief review, to list all of these tasks. You will find all the other tasks with detailed instructions in Gary Halbert letter. Just follow them word-for-word and soon you will see your copywriting skills sky-rocketing. Here you find yet another great post on writing a world class copy by Gary Halbert. The steps above are how I am learning the fundamental skills of copywriting. They are so efficient that it takes my breath away. Honestly! 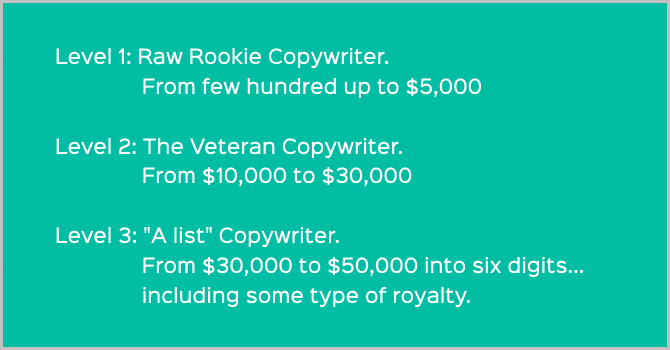 You don’t have to be the smartest person in the room to write a good sales copy — just follow the steps shown above word-for-word and these skills will propel you ahead of a majority of copywriters in the world. Finally, are you are interested in building an Internet Marketing business from the ground up? Stop Using Excuses Now and Act At Once! You invest some time upfront now. Your work and efforts will be seriously rewarded in the long-haul. How else can you learn to write good sales copies? Please drop me a comment below and I will get back to you.